I need not introduce How Yoga Can Wreck Your Body, the New York Times article that’s gone viral. My first response upon reading it: These anecdotes are outliers! Who sits in Vajrasana for hours daily, tears Achilles tendons in Downward Dog, or pops ribs in a spinal twist?! Overflexing my neck I’ve tweaked my cervical spine in Halasana and Salamba Sarvangasana, typically when pressing my chest too forcefully toward my chin. Lesson: Ground my elbows (and rest my ribcage in my palms) to lighten the weight on my neck. Cultivate a sense of repose in shoulderstand and its kin. Unexplained knee pain after Virasana In early 2010, I felt pain in the back of my right knee after exiting Virasana. A doctor conjectured that my meniscus had micro tears and would heal by itself over time. Indeed, my MRI results were normal and the pain eventually subsided. Lesson: Work on stretching my quadriceps and gradually increase my Virasana hold time. Expect “mystery” conditions to appear now and then. 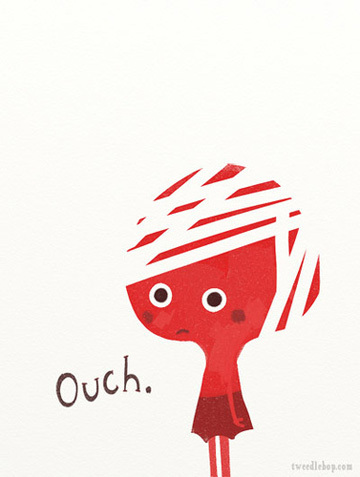 That said, I blame my injuries on my own overzealousness and momentary attention lapses. Asana, no matter how strenuous, is not inherently risky. It’s not speed skiing or tow-in surfing! Asana is controlled movement in a controlled setting. Chances are, I could have prevented my injuries. While the serious cases mentioned in the NYT article are inexcusable, occasional muscular strains are perhaps inherent in a vigorous asana practice. If I’d done only restorative yoga and never attempted to move beyond “level one,” I might be injury-free today. But isn’t yoga about exploring our perceived limits? If I do a pose and feel absolutely comfy, I’m probably merely going through the motions. I should feel strong sensation (which, by the way, isn’t synonymous with pain) during practice, but not after. And if I do injure myself, I must determine why—and learn from it. Nice!! Love your awesome response to the NYT!! I agree with you! This article is making its way around my small yoga community this week too. I enjoyed your insight and response. My thoughts when I first read the article were, yes, some forms of yoga are more prone to injury than others. My second thought was: find me an activity that doesn’t cause injury! A fellow practioner summed it up: he’d rather run the risk of injuring himself, while having fun, than leading a sedentary life. I agree. I understand that even working within ‘my’ limits, one day I might just injure or aggravate something. It happens. Hopefully I’ll learn from it and move on. And yeah, the examples cited in the article (stroke, popping ribs) seemed to be *very* extreme and unusual cases. Good response! I once held a headstand for about 5 minutes (of course without adequate shoulder stability), just because I could and it was fun. Quite a neck ache the next day. That was stupid. Lesson learned, limits found. Therein lies the yoga, right? A follow up article I saw pointed out that statistically, using the same number of participants, there are as many injuries from golf as yoga. Nice article, Luci. yes, i know someone who broke her arm by tripping while walking on the sidewalk. there’s nothing that’s risk-free, but i do know that the injuries risked through active living are far preferable to the injuries incurred through living in fear, sacked out on the couch. ouch! Often, our limits are found not in the immediate response our bodies offer, but in the day(s) following activity. Thus the importance of not pushing yourself too far too fast. My personal lesson has been not to try and make my posture look like anyone else in the room. Instead, I try to do the best I can with what I have, and invite myself to improve slightly each time I practice.